Long before now, Google only allows us to share about 25MB file attachment on Gmail. But the uplifting news now is that. 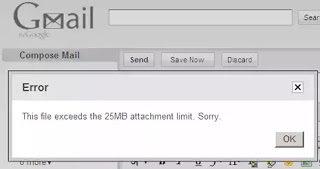 Google has increased the limit of sharing attachments on Gmail to 50MB. However, there's still a downside to this update, which is; you are only allowed to receive files up to 50mb but the sending size limit will remain the same at 25MB, this is because Google recommends that users who wish to share files larger than 25MB, should use Google Drive. Recall that Google Drive allows users to share files upto 5TB in size, given that the user's drive account has ample storage. The full roll out of this feature will be completed within 3 days, and after which it will be available for all Gmail users worldwide - Said Google. For me, I'll say this is a welcome development because most times we get stocked on receiving files larger than 25mb but that is history now. Kindly set your Date and Time. It'll fix the error. Try using another browser then.